some snacks for lunch today and tomorrow. Yee-haw! Good grief, Charlie Brown! It took me 5 hours to hike less than 6 miles today, and that was carrying a pack barely heavier than a day pack. My knees hurt just as much as they did when I hobbled in to Pinkham Notch last Monday. Six days of rest seem to hqave dome absolutely nothing for them. I can barely walk now. My plan for tomorrow was to hike 15 miles from here to Rt 2. There is no way that is going to happen. I've got to find the easiest way out of here and take that tomorrow. I know that in the great scheme of things this is no big deal, but it sure feels like it is right now. Not a good day today. that was! Apparently, there are 'normal' hiking trails in the Whites. in all it was a comfortable walk. figure out if it is worth making one more attempt to finish this hike. time to finish the hike well before October 15.
shorter, whivh means less hours and thus fewer miles in a given day. necessitate another break from the trail. Thursday to try to complete this darned hike. life as a thru-hiker. It is, after all, a pretty sweet way to live. You hike. You camp. You see new places and meet new people every day. You eat as much of everything as you can possibly get your hands on. your mind wander where it may. so here's hoping my knees are up to the task! Hampshire that day. Plans are pushed back one day to Friday. Geez, it's September already! How did that happen? down mountains and over rough terrain, remains to be seen. And James, you're right, I do miss sleeping in my hammock! Well, everything* is packed and ready to go. I made a trip to the grocery store this morning and spent $70+ on food for 8 days. That's 4 days in my pack, and another 4 days of food in a box I mailed to Pine Ellis Lodging in Andover, ME. When I think about it I think I have about a 50/50 chance that my knees are up to the hike. Until today I haven't felt a lot of confidence or anticipation about getting back on the trail, but now that my backpack is packed and I've been finalizing the logistics for the rest of the trip, I've started feeling and talking about it all much more positively. Instead of saying "If I get to Monson," I've been saying "When I get to Monson." The weather for southern Maine looks great for the next week (see below). I think if I get through the next week or so I should be all set. That will get me through the toughest terrain, then things will start to ease up. My plan is to get up at 0400 tomorrow, and be on the road by 0500. With a stop somewhere for breakfast that should get me on the trail by 1000 at the latest. Ideally I would like to make 12 miles tomorrow, but there is a shorter option. I've given up trying to estimate how many miles I can hike in a day anymore. I will not be picking up exactly where I left off. I am going to start at US 2 near Gorham. This works out better logistically as far as getting to the trailhead, and it also allows me to avoid hiking up and over Carter Dome on my first day back, which is ridiculously steep and difficult. I do have a pretty good sized chunk of guilt in my stomach over missing the few miles from Carter Notch to US 2, but it might be the difference between completing my hike and not, so I think it's a fair trade-off. * I just realized I am short one pair of socks. Looks like I need to do some laundry this afternoon. Sunny. Highs in the upper 70s. West winds around 10 mph. Mostly sunny. Highs in the upper 70s. Light and variable winds...becoming northwest around 10 mph in the afternoon. Partly cloudy in the evening...then becoming mostly clear. Lows in the upper 40s. Light and variable winds. Mostly sunny. Highs in the upper 60s. Light and variable winds...becoming northwest around 10 mph in the afternoon. Mostly clear. Highs in the lower 70s. Lows in the lower 40s. First, a word about the mileages given above. You all know that I skipped about 15 miles of trail between Carter Notch Hut, where I got off the trail a couple of weekends ago, and US 2 where I started this morning. You know I missed that section, and I know I missed that section, so I am not pulling the wool over anybody's eyes. But those miles are included in the mileage totals I keep, as that is the only way to keep the mileage synced to the guidebook. To do otherwise would leave me in a constant state of confusion. Jodi and I were on the road a few minutes after 5:00 this morning, and I was on the trail at 9:15. Skipping the section over Carter Dome was definitely the right decision. Today's hike was, for New Hampshire, an easy section. There was plenty of ascending and descending, but it was hiking on a trail, not climbing up and down rocks. Even so, it was a tough workout for my knees. The braces help A LOT, but I still move rather slowly, and even more so on the dowwnhills. I think I am moving at a normal pace on the rare flats and when ascending, but on the downhills I guesstimate I am making slightly more than 1 mile per hour. It took me 7 1/4 hours to reach this campsite today. With a 45 minute break for lunch, that makes it 6 1/2 hours hiking for 12 miles. I can live with that. I spent the day telling myself that as long as I can cover 10 or 12 miles per day, I am fine. At ten miles per day I will cover the 300 miles in 30 days. That's doable. But I am not out of the woods (metaphorically) yet. The terrain is going to get a lot tougher in the next couple of days, and it is going to stay that way for quite a while. I am still estimating that I have a 50/50 chance that my knees are going to stand up to the abuse. I felt like I was moving oh-so-slowly today, but there are lots of weekenders out for the long holiday weekend, and I passed several of them. That just serves to remind me that I am not moving as pitifully slowly as I imagine I am. I hike slowly, but I still have great stamina and instead of taking all those frequent breaks that weekend warriors have to take, I move along steadily for 3 or 4 hours at a time. I have my hammock hung over a tent platform here tonight. Just across the way is a large group of college kids from Colby College, on a freshman orientation trip. I am getting a big kick from listening to them play silly games while seated in a circle. There is no cell reception here, so you won't see this for a while. Hopefully I will have reception somewhere tomorrow and I will get to send this. But I will say "Goodnight from Gentian Pond" anyway. 9.6 miles. That must sound to you like I had an easy day. Ha! It took 9 hours to cover those 9.6 miles. I said the terrain was going to get tough, and it seems I am quite prescient. I'm not complaining; at least not much. It was a gorgeous day, and the views when I was above timberline were awesome. A cool front moved in today, sweeping away the lingering humidity and treating us to a dry, cool breeze. It is a bit after 6:00PM as I write this, and it is actually quite chilly. I am wearing long pants, both my lightweight and my medium weight thermal shirts, my down sweater, and a cap. It should be glorious sleeping weather; the kind of weather where it feels so cozy to snuggle down into the warmth of the sleeping bag. Tomorrow morning I will go through Mahoosuc Notch, known as the hardest mile on the AT. I've no idea how long that is going to take. Someone fell in the Notch last month and broke a leg. I don't want to do the same, so will be moving slowly and cautiously. After Mahoosuc Notch comes the climb up Mahoosuc Arm, which is suposed to be very tough. My plan for tomorrow is to hike the ten miles to Grafton Notch, then get the folks at Pine Ellis Hostel in Andover to come pick me up. I'll get them to shuttle me back on Monday morning, then I will slack pack the next ten miles north. 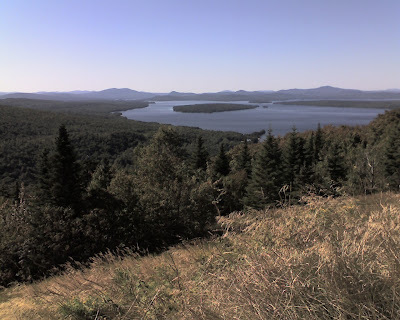 I plan to base there for 4 or 5 days and slack pack all of the trail up to Rangeley, where there is another hostel and I may just repeat the same process there. Oh, my knees. Thanks to the wonders of ibuprofen, my knees felt good this morning. I continued to baby them as much as possible all day, and they fared pretty good. The last couple of miles they were starting to hurt, but considering how tough the climbs and descents were, I was very pleasantly surprised. Here's hoping they continue to do so well! The weather was perfect today. It was cold last night and I slept SO good all snugged down into my down sleeping bag. I was awake a few minutes after six and after packing up and eating some hot oatmeal (first time in months), I was hikin a few minutes after 7:00. A mile and a half into the day's hike I reached the south end of Mahoosuc Notch. Mahoosuc Notch is a tight notch between two mountains that has filled up with gigantic boulders that have come down from either side. The trail winds around, over, and under these jumbled boulders for a mile. It is known as the toughest mile on the AT. It took em 2 hours and 10 minutes to make my way through the notch. Several times I had to take my pack off and either push it ahead of me or pull it behind me as I crawled through some tight passages. It was actually quite fun although I was getting tired of it by the end of the second hour. /2 miles of downhill and it took a toll on my knees, but all in all it was a pleasant way to end the day. So I have gotten a shower, walked to the general store / diner for a bacon cheeseburger and fries, and will sleep in a bed tonight. Tomorrow I will slack pack from Grafton Notch back here to Andover, and over the next few days will continue slack packing sections northward. Hopefully that will make things easier on my knees. I haven't slackpacked since those two days back in Massachusetts when Jodi came out and slackpacked me. Boy, is it nice! I had arranged for a 7:00AM shuttle from the hostel back to Grafton Notch, so I set the alarm on my cell phoneto go off at 5:15. By 5:30 I was seated at the counter of the local breakfast place ordering up a hot, cooked breakfast. So much better than the cold cereal or instant oatmeal I eat when I am camping. By 7:45 I was starting my hike up the south side of Baldpate Mtn. With only a light day pack on even climbing a mountain was almost a joy. I stopped at Baldpate Shelter to look through the shelter register and see when some of the people I know came through here, and to refill my water bottle. Pushing on, I got to the summit of Baldpate around 10:00. The mountain is aptly named as the top is mostly a dome of naked rock. It was fun walking up it on this nice dry day, but it surely would be a different story in wet weather, or something like a freezing fog! That would make it suicidal. Somehow I ended up being the only person at the summit and I stayed there for about an hour. It was wonderfully quiet. All I could hear was the wind blowing, and the occasional fly buzzing around. I could hear no cars, no trucks, no lawnmowers, chainsaws, or airplanes. How wonderful! I took advantage of the cell phone reception up there and spent some time talking to Jodi back home while lazing in the sunshine, then I called the hostel and told them I estimated I would finish the hike by 3:00PM and arranged for them to pick me up at that time. Leaving the summit of Baldpate I had to negotiate a few tricky sections going down the north side, but mostly I was actually hiking on a normnal hiking trail. How refreshing! I soon reached Frye Notch Leanto and stopped there for lunch. Lunch was a ham & cheese grinder I had ordered while I was earting breakfast this morning. Yum! It was now 12:30 and I had 4.6 miles left to hike. Based on my experience over the last few days, there was no way I was going to make it in time. But those standards didn't apply here. 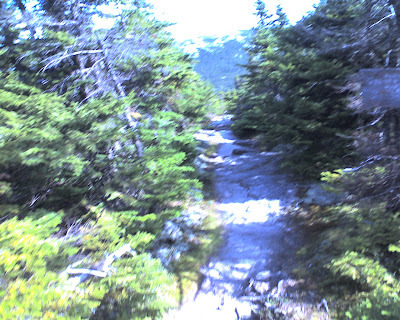 I made great time on the relatively easytrail, and by 2:00PM I had reached the stream crossing in Dunn Notch. At the same time, I caught up with another hiker staying at the hostel, and since he had a car parked at the road I called the hostel and canceled the scheduled shuttle. Half an hour latedr we were at the road, and another half hour after that we were back at the hostel, I was showered and changed into (relatively) clean clothes, and I had walked to the general store to buy beer and Ben & Jerrys ince cream. I spent the rest of the afternoon sitting on the front porch chatting with some of the other hikers, and with David, one of the proprietors. As a sideline, David makes jewelry out of moose droppings. Anybody out there want a nice pair of moose pellet earrings? David tried to convince me to buy a pair for my wife, but I am quite sure Jodi would not appreciate them. Maine is really beautiful, especially with the ideal weather we have enjoyed lately. I am afraid my fixation on my physical difficulties is overshadowing that and I am not giving youy a fair picture. In spite of all the difficulties, I do appreciate the beauty all around me. I guess I just wish it didn't hurt so much to get out there sometimes. 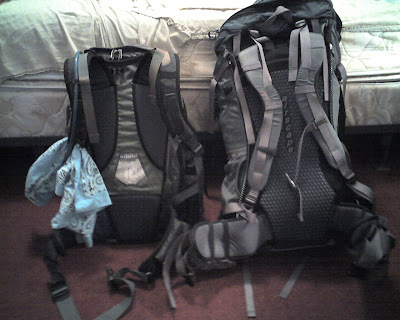 Slackpacking takes a good deal of the physical difficulty away, and let's me appreciate it all the more. I expect to stay here at least another two days and get about 24 miles of trail done by slackpacking. I could keep slackpacking from here beyond that, but the shuttles get more and more expensive as I get farther away. I'll figure that out when the time comes. 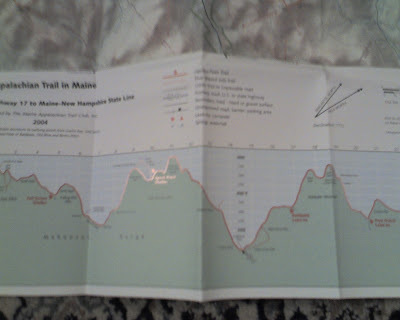 This is a photo taken with my cell phone camera showing the map and elevation profile for some of the terrain I have been hiking the last few days. Ah, what a lovely day to be hiking in Maine! I set off early this morning and had a wonderful time slackpacking along easy trail through the cool of the morning. I covered the 6 or so miles to Hall Mountain Lean-to quickly, so ended up eating my lunch there at 9:45 this morning. It was so nice to just cruise along enjoying the forest instead of fighting for every foot of forward progress. ver saw any orange flagging as I approached from the bottom of the hill. I don't know why that is; whether I just mised it, or whether it was absent. Tomorrow will be my last day slackpacking from here. I have really enjoyed my time staying at Pine Ellis. Ilene (I misspelled her name in a previous blog entry) and David are wonderful hosts. Tomorrow I will slackpack from South Arm Rd northward for 13.3 miles to ME 17. On Thursday I will start at ME 17 with my full pack and hopefully hike the 13 miles to ME 4 and then get a ride into Rangeley. I hope to base in Rangeley and slackpack a couple more days until I get through the Saddleback Range. Man, oh man, what a perfect day today was! Today was the quintessence of early fall in New England; a cold crisp morning followed by a day just warm enough to work up a sxweat while hiking hard, but cool enough that it felt good to sit in the sun when stopped. The sky was a deep blue, the air was dry. The light had that crystalline quality that comes in the fall when all the summer humidity is gone. The landscape is beginning to take on the look of autumn, although if you look you can't find any particular item that singly looks like it. I saw a moose early this morning. I was hiking north on the trail, and a bull moose was walking south. When he saw me, or more likely heard one of my hiking poles strike against a rock in the trail, he spun around and took off at top speed into the forest. He whirled so fast that he actually left a divot in the trail. It was amazing to see such a large animal move so quickly through the tangle of trees. Later, while walking along the ridge that connects the three peaks of Bemis Mountain, I was reveling in the whole atmosphere of the place. The colors in the lichen and mosses on the rocks were amazing. The foliage of the evergreens was set off by the deep blue of the sky. I was walking along thinking how quiet it was, and a bird started signing. It was just such a perfect moment I actually got choked up a little bit. And at the end of my hike I came out onto Rt 17 and the road was half way up the hill with an amazing view down across Mooselookmeguntic Lake. It was SO beautiful. Somebody has installed a bench there and I thoroughly enjoyed sitting there taking in the view for a half hour or so while I waited for my shuttle to arrive. A good day, well done. Almost 90% done! 90% will be 217.83 miles, so I am only 2.2 miles shy. tough on my tender knees. site. In fact, they had even installed a huge orange "WORK ZONE AHEAD"
would call the hostel for a ride. I will be back to slack packing tomorrow.